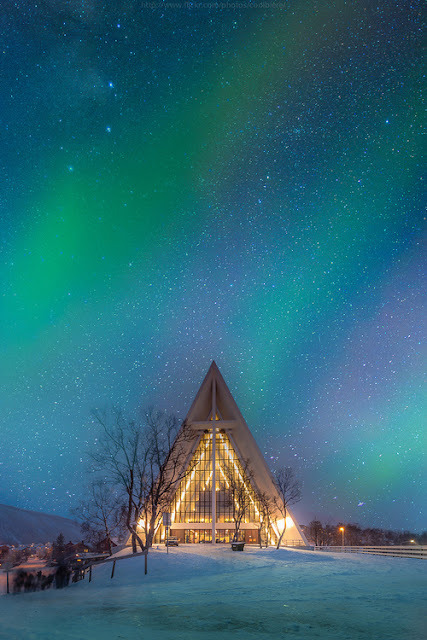 The Arctic Cathedral, formally known as Tromsdalen Church or Tromsøysund Church, is a church in the city of Tromsø in Troms county, Norway. The church is commonly nicknamed the Ishavskatedralen, literally "The Cathedral of the Arctic Sea" or "Arctic Cathedral". The church was built in 1965 in the Tromsdalen valley and it is a parish church and not, in fact, a cathedral as it is commonly called. The church is part of the Tromsøysund parish in the Tromsø arch-deanery in the Diocese of Nord-Hålogaland. The church was designed by the architect Jan Inge Hovig and is built mainly of concrete. The main contractor for the construction was Ing. F. Selmer A/S Tromsø. Because of the church's distinct look and situation, it has often been called "the opera house of Norway", likening it to the famous Sydney Opera House in Sydney, Australia. The church is probably the most famous landmark in Tromsø, although Tromsø does have another church of interest, Tromsø Cathedral, which is noted for being the only wooden cathedral in Norway.